"If anything can go wrong, it will". Murphy's law came true during our trip. We boarded a Southwest flight from SJC on Aug 8th. The flight got delayed by an hour. We reached Denver late in the night. It took us about an hour to rent a vehicle from AAdvantage. I didn't realize that customer service could be THIS BAD. It took another 2 hours to get to our hotel in Colorado springs. By the time we reached our hotel, it was about 2 am in the morning. The receptionist in the hotel took another 30 mins to check us in. Finally, the hotel keys didn't work. I have to come back to the reception to get that fixed. 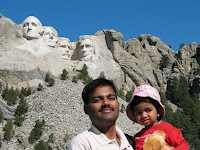 During this trip, we were accompanied by my friend (Santhosh Ram)'s family also. The hotel served a complimentary breakfast (just muffins & orange juice). 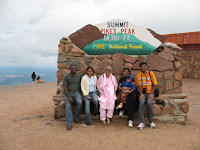 We went to Pikes Peak & Royal Gorge Bridge on the first day. Pikes peak drive was nice. It was an awesome view from the top of the peak. There was hardly any oxygen to breath. We spent about an hour there and drove to Royal Gorge Bridge. Royal Gorge had lots of activities. I think you can spend the whole day there. We went on the Aerial Tram & Inclined Railway. We walked over the bridge & spent a few minutes at the Inspirational Point. The Gorge was beautiful. But the bridge didn't create a 'Wow' effect! There were a few rain showers in the evening. My daughter had lots of fun in the rain. She also enjoyed her time in the carousel. 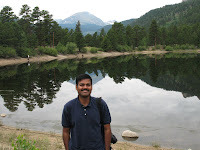 On Aug 9th, we went to Rocky Mountain National Park. We spent the whole day there. The rock formations looked great and it is a very scenic location. There were lots of gorgeous lakes and rivers. Rain spoiled our day. We hardly spent any quality time in the park. In the evening, we returned our rental van and rented individual cars. I drove to Hot Springs, SD. My friend decided to spend the 3rd day in Colorado. I had a 6 hours drive to Hot Springs. We wasted about 30 minutes to find our hotel (Google maps screwed up as usual!). Finally, I stopped a cop vehicle to get help. He guided us to the hotel - nice cop! :) The stay in Rodeway Inn, Hot Springs was very comfortable (except for the poor complimentary breakfast. They had just muffins & orange juice. There was no milk also). On Aug 10th, We drove to Keystone to visit Mt. Rushmore. It is a very beautiful & amazing place. They had spent about 14 years to carve the memorial. The memorial has carvings of George Washington, Roosevelt, Jefferson, & Lincoln. It is a perfectly done & well maintained art work. 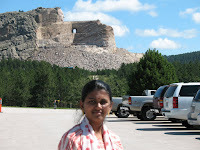 We spent about 2 hours there and left to Crazy Horse Memorial. The entry fee was 20$ per person (It was just 10$ per person in Mt. Rushmore). It looks like Crazy Horse Memorial is getting constructed from public funds. Hence, they are charging more money. This memorial is being constructed to honor the sacrifice of Red Indian Soldiers. They had already spent about 60 years already. It would look as if the work has just begun. It is amazing to see that people have dedicated their entire life for this kind of construction. We watched the video show in Crazy Horse Memorial that explains the history a bit. We then had our lunch & started driving to Denver. Well, I forgot to mention about my car. I had rented a 2008 LE Camry - it was sooo... comfortable driving it. We reached Denver airport on time, boarded the flight & reached SJC in the night. The best part of our trip is the visit to Mt. Rushmore & Crazy Horse Memorial.